The popular Australian Granny Smith apple grows happily in many parts of the United States. Like many of the well-known supermarket varieties, Granny Smith is undergoing something of a renaissance as apple enthusiasts discover that the qualities that have made it so successful as a supermarket apple can also be useful in the home orchard. Granny Smith is a versatile apple, great for eating fresh of course, but also a good apple for sweet and savoury salads (since it does not go brown readily) and a good choice for apple pies - slices keep their shape when cooked. (For best cooking results, pick when slightly under-ripe). Granny Smith prefers the warmer zones - 6 and higher - but can be grown across quite a wide range, and zone 5 is a possibility although be aware that it likes a long growing season to ripen. The flavor of home-grown examples in the warmer states can be more complex and interesting than the one-dimensional tart acidity of store-bought apples, particularly if you allow the apples to ripen fully on the tree. As well as the distinctive green skin and tart flavor, Granny Smith is well known for its excellent keeping qualities. It is one of the best apples for home storage. Fill in the details below and we will let you know when Granny Smith apple trees are back in stock. Cropping is usually very good but the famous bright green color is only achieved in areas of warm days and nights. 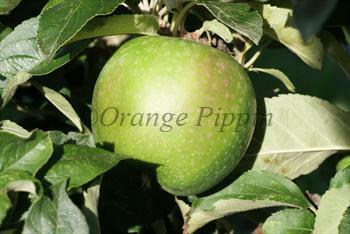 In cooler zones where temperatures drop overnight Granny Smith can develop an attractive but uncharacteristic red flush. Granny Smith is generally easy to grow, but it can lapse into biennial bearing if allowed to over-crop. One of the unusual features of Granny Smith is that the apples tend to grow within the foliage, on the inside rather than the outside of the tree - as can be seen in our main photo. Granny Smith is a very good pollinator of other apple varieties, making it an excellent choice if you are establishing a small orchard in the warmer climate zones. Discovered by Maria Smith, Australia, 1860s.